stamped on cover: Missale; in brown ink on foredge: missale / 74.a; inside upper cover bottom center in brown ink: VII 5134; lower cover upper center in graphite: Coll. Cpet. (Daniella Laube, Cat. 5, no. 3); Collection of William J. Wyer, New York; gift to NGA, 2011. 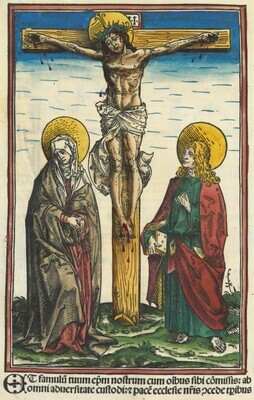 Schottenloher, Karl.Die liturgischen Druckwerke Erhard Ratdolts aus Augsburg, 1485-1522. Mainz, 1922: xvii. Adams, Herbert Mayow. Catalogue of books printed on the continent of Europe, 1501-1600. Cambridge U.P, 1967: L-1190.